Pittsburgh, PA – January 22, 2013 – Warmer weather may still be months away, but Animal Friends wants you to “beat the heat” by spaying your cat in advance of her heat cycle and preventing unwanted litters from being born this Spring. To help reduce the number of homeless cats born this spring, Animal Friends is offering a special “Beat the Heat” promotion sponsored by PetSmart Charities®. 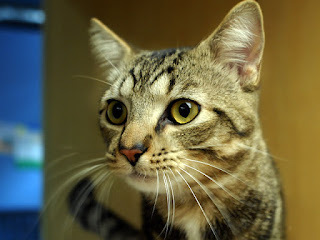 During the entire month of February, Animal Friends will spay female cats for a special rate of $20. Spaying and neutering is one of the most effective ways to reduce the homeless pet population. While some worry that their pet may be too young for this procedure, spaying and neutering is safe for kittens as young as eight to 10 weeks old, according to the American Veterinary Medical Association. This special rate is even less than the organization’s normal low-cost price and is available to all residents of Allegheny County. Cat parents who wish to take advantage of this offer must mention the “Beat the Heat” promotion when they schedule their appointment. Thanks to the PetSmart Charities grant, Animal Friends will provide cat sterilizations for $20 during February. Please visit www.ThinkingOutsideTheCage.org or call 412.847.7004 for more information or to schedule an appointment. About PetSmart CharitiesEstablished in 1994, PetSmart Charities, Inc. is an independent, nonprofit 501(c)(3) organization that creates and supports programs that save the lives of homeless pets, raise awareness of companion animal welfare issues and promote healthy relationships between people and pets. The largest funder of animal-welfare efforts in North America, PetSmart Charities has provided more than $165 million in grants and programs benefiting animal-welfare organizations and has helped save the lives of more than 5 million pets through its in-store adoption program. To learn more about how PetSmart Charities is working toward its vision of a lifelong, loving home for every pet, visit petsmartcharities.org or call 1-800-423-PETS (7387).